Blah, blah, blah… QE, QE, QE… Get on with it already! All this market talk about the Fed doing QE is really starting to irritate me. The strong upward trend has been making it difficult for me to jump in on a retracement. Fine, fine… I guess the reason why I’m feeling a bit antsy is because I’m seeing EUR/USD stage a really strong rally and I’m not in a long trade. Looking at the charts, I see a couple of setups that I could’ve taken but didn’t. There was one on Monday when price pulled back to 1.3650 and another one yesterday, when price retraced after hitting 1.4000. Aside from that, I haven’t been getting triggered on my HLHB system because the move has been so strong! Since that last trade that net me some really sweet profits, EUR/USD has risen another 700 pips! 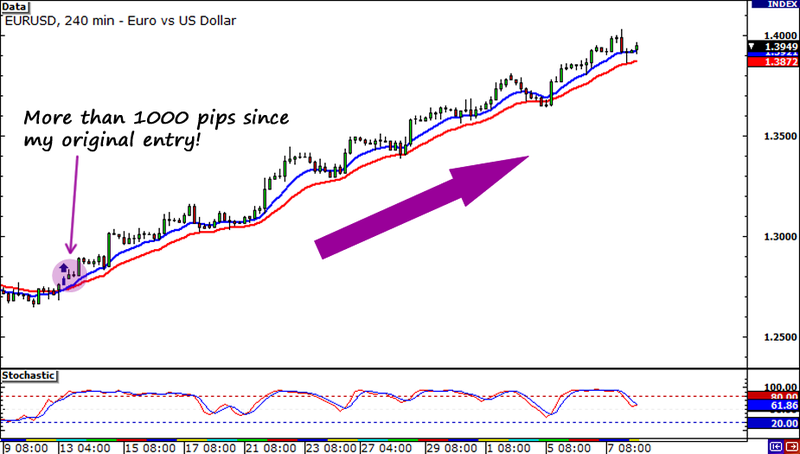 If I had kept my trade open, I’d be up over 1000 pips! Argh! I probably wouldn’t feel this way if the pair was simply ranging. Yes I know, the rules of my system have saved me many times already and it’d be better to follow them to the letter. But I can’t help but feel a little crabby. Anyway, enough bad vibes for now! The weekend is coming up and it’s time for me to relax and take my mind off the markets.